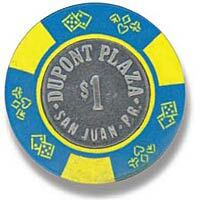 It was December 31, 1986, and the Dupont Plaza Hotel and Casino in San Juan, Puerto Rico, hummed with preparations for that night's New Year's Eve gala. The casino was scheduled to close by 6 p.m., much earlier than usual. A higher-than-normal number of visitors placed hurried bets at the tables, anxious to get in enough play time before the casino closed. Call In All Your Chips ? This solitary casino chip miraculously survived the super-heated inferno that incinerated the casino floor. At 3:30 p.m. a fire broke out. Employees attempted to suppress it to no avail. The manual fire evacuation alarm installed in the high-rise tower malfunctioned. As verbal warnings about the fire echoed through the lower levels of the hotel, smoke began spreading into the casino. Even this did not provoke a full evacuation; only a few individuals began moving to the exits. Flashover occurred in the south ballroom and fire violently vented into a stairway/foyer area, spewing deadly products of combustion toward the lobby and casino. Within eight to 13 minutes after the discovery of the fire, heavy black smoke billowed through the main lobby, past the casino and out the spiral stairway exit. Smoke heated to 600 degrees Fahrenheit filled the two-story high foyer, shattering its exterior glass panels. Almost simultaneously, the hot gases and flames exploded the glass wall between the foyer and the casino. Within 45 seconds, a front of black smoke followed by flames swept through the lobby and the entire length of the casino, killing dozens. The inferno engulfed the high-rise tower, trapping hundreds of occupants. 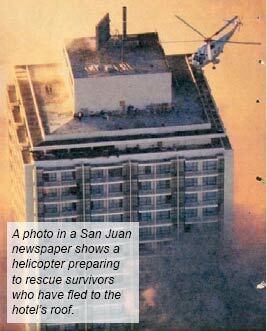 Rescue workers rushed to the top floors, herding the panicky occupants upwards and onto the roof where helicopters lifted them to safety. The Investigation Begins ? An ATF National Response Team member probes the rubble for clues. The fire burned for nearly five hours. When it was finally extinguished, 96 people were dead. Another 150 had been injured. One of the fatalities was a U.S. Secret Service special agent working on a counterfeiting investigation; his charred body was found in the currency counting room adjacent to the casino. Most of the fatalities and injuries occurred in the casino when the visitors were blanketed by the racing smoke and flame front. Miraculously, only one person in the high-rise tower died. The damage to the building was estimated to be $6 million. Air Power ? A C?5A military transport assigned to the 436th Military Airlift Wing flew members of the Northeast National Response Team, along with what was then known as "ATF's fire/explosion investigation vehicle," to Puerto Rico's Roosevelt Roads Naval Air Station. Puerto Rico's police superintendent requested assistance from one of ATF's four regional response teams. 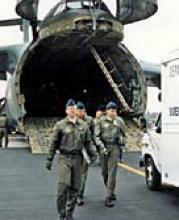 A C-5A military transport assigned to the 436th Military Airlift Wing flew members of the Northeast National Response Team, along with what was then known as "ATF's fire/explosion investigation vehicle," to Puerto Rico's Roosevelt Roads Naval Air Station. By the next morning ? New Year's Day 1987 ? the ATF team was already on the ground investigating. This was quite a feat considering it was the first time that a response truck was flown overseas to a crime scene. ATF Deputy Chief Counsel Teresa Ficaretta remembers the Dupont fire well. "I was a staff attorney assigned to assist the NRT agents in preparing to testify in court," she said. "ATF had not investigated a fire of that magnitude before. Since the hotel was constructed using concrete and steel, it was surprising the devastation that was caused by the fire. It was horrific." Teamwork ? In investigating the Dupont fire, Northeast Response Team members not only pulled together all responding law enforcement resources (most of whom spoke only Spanish), but were able to quickly integrate the diverse group into the NRT concept. Because of the multiple explosions, witnesses thought the conflagration was a bombing incident. But based on the physical evidence found at the scene and from more than 400 witness statements and interviews, ATF determined that the fire was an intentional act of arson; that the area of origin was in a stack of furniture in the south ballroom; and that the fire was initiated by one or more cans of Sterno-type cooking fuel placed or thrown at the points of origin. Eventually, three union members involved in tense wage and job security negotiations were developed as suspects. On January 13, 1987, Hector Escudero Aponte was arrested for malicious damage to interstate property and later charged with 96 counts of murder. A short time later a second suspect was arrested and charged with the same violations. Three days after that, a hotel bartender who had been instructed by the Police of Puerto Rico to come in for an interview committed suicide by jumping to his death from a 17-story building. 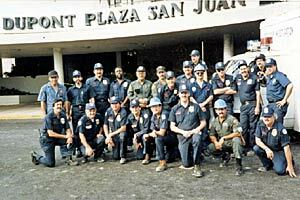 The National Response Team concept was relatively young at the time of the Dupont arson investigation and was considered the only specialized response concept of its kind in federal law enforcement. The NRT concept grew out of ATF's explosives related jurisdiction that came with the enactment of the Explosives Control Act in 1970. 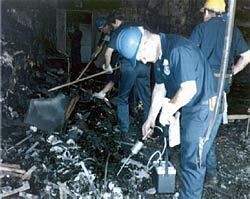 By 1978, ATF had implemented its formal arson program. The program continued to evolve until a national response capability was developed that established two NRTs with one operating in the east and one in the west. By 1980, ATF had four teams located in the Midwest, Northeast, Southeast, and Western regions of the United States. In investigating the Dupont fire, Northeast Response Team members not only pulled together all local responding law enforcement resources (most of whom spoke only Spanish), but were able to quickly integrate the diverse group into the NRT concept. They did this by providing on-scene training to law enforcement regarding the collection of arson-scene evidence, and by teaching interviewers how to extract from witnesses specific technical information that is paramount to successful arson investigations. 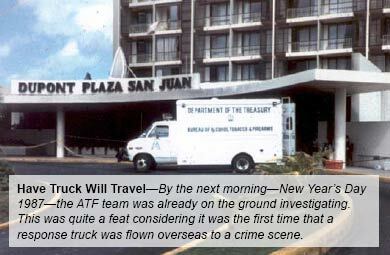 ATF's 1987 investigation of the Dupont Hotel fire in Puerto Rico was a success because NRT members understood the importance of respecting and working closely with local authorities-a bureau-wide philosophy that continues to this day. Editor's Note: Hector Escudero Aponte, 35; Armando Jimenez Rivera, 29; and Jose Francisco Rivera Lopez, 40, pleaded guilty on April 25, 1987 to setting the New Year's Eve fire that killed close to 100 people at the Dupont Plaza Hotel. All three worked at the hotel.